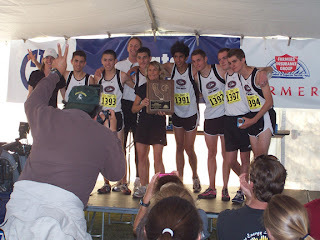 Did you ever wonder about what makes a successful cross country team? 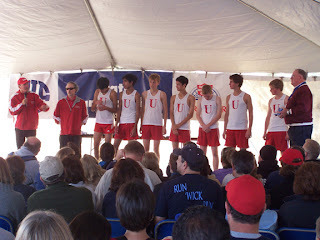 Why do the same teams land on the podium in Fresno year after year? 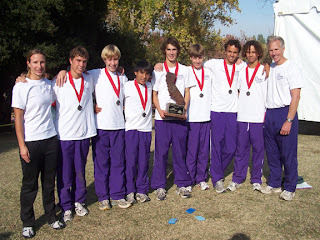 Here is, in my opinion, a list of what makes up a successful cross country program. Keep in mind that while each element aids in the success of a team, not all are required for a successful team. 1) Coach with long tenure at school-Take a look at the top programs in the state and more than likely, the head coach (along with the long line of assistant coaches) have been part of the program for many years. Stability at the top is the key to long term success. 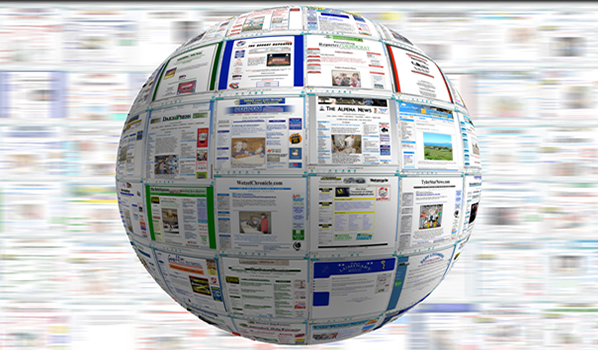 2) Team Website-While not necessary, in this age of the internet, a team website has many uses. 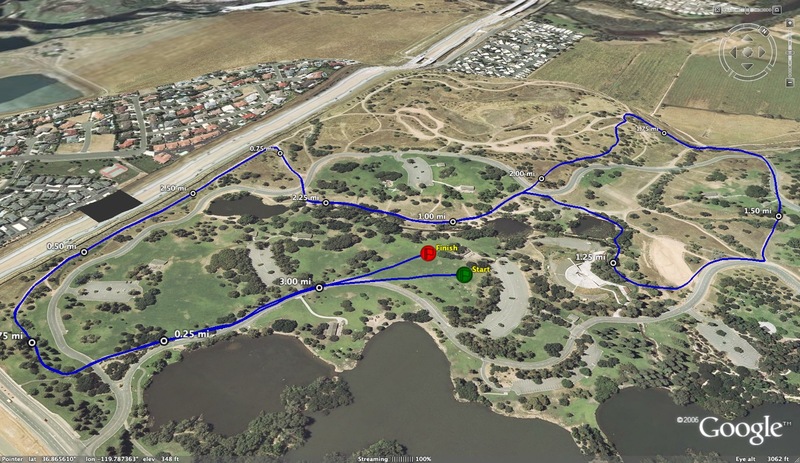 Coaches can communicate, update and motivate their runners and parents. Team pictures from the last meet or spaghetti dinner can be posted. Links to the best injury prevention information. The list goes on. 3) Supportive parents-Coaches think they can do it all but if they are smart, they would use the resource that is readily available to them, parents. Most parents are thrilled to help the coaches in a positive manner. They just need direction. 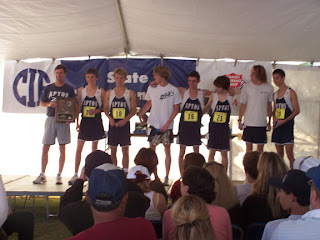 4) Summer Running Camp-Whether it's Lake Tahoe, Mammoth or a team cross country camp, the team needs to go travel somewhere during the summer. And why are these so important? Kids have to get in shape beforehand to handle such camps so the camps themselves are great incentives for your kids to run over the summer. 5) Tradition-I once heard that a tradition is anything repeated twice. What does your team do that you would consider tradition? Is there a crazy hat day? Do you stay at the same hotel at the state meet? Traditions give the runners something to look forward to during the season. 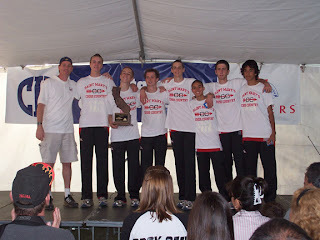 6) Team records-Who is the fastest junior on the Mt. 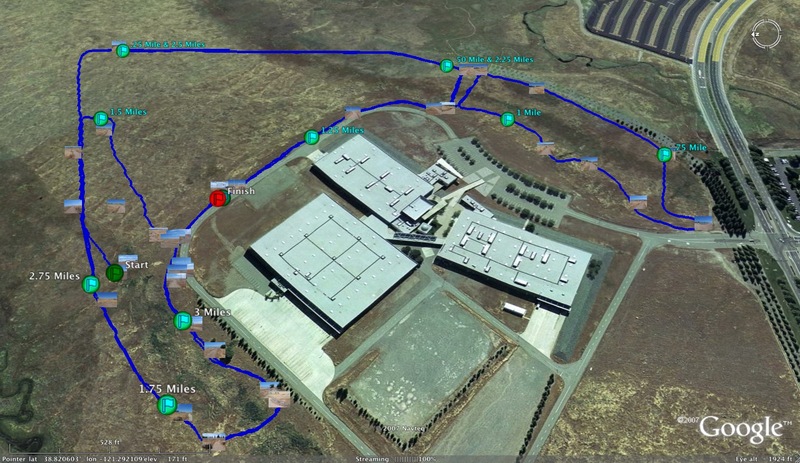 Sac course? Who holds the record for the team ice cream run? You want to find the fastest runner in 1965? You want to really motivate all the runners on the team? Keep all records! 7) Team photographer-While this is more than likely another parent, a team photographer allows the coach to yell, scream, or as most think they are doing, kindly encouraging his or her athletes. 8) Team get togethers-While it's great to run together over hill and dale until the cows come home, it's important for teams to have team get togethers like spaghetti dinners, pool parties or just spending a few hours at the local miniature golf place. 9) Feeder program/Recruiting-This could be your local middle school or a local track club but something needs to grab runners for you before they turn to other sports. You want to have a great cross country team, get the best athletes at your school to come out for your team. 10) Local Newspaper-Your parents know you run a great program but your local newspaper can spread the word for you. Contact them after each meet and sell your team. 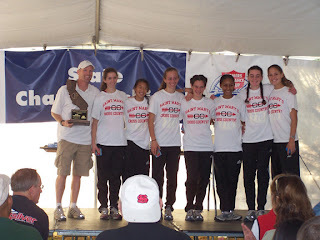 So from that top 10 list, which are the most important aspects of a cross country team? What did I miss? Feel free to add your own thoughts about what makes your team so successful? 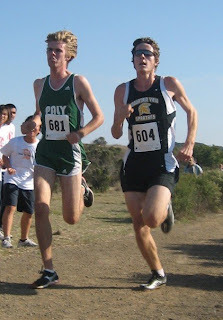 Here is a new blog that has been started by two of the best NCS runners from '06/'07 (Joey Kochlacs of Campolindo and Calvin Thigpen of Maria Carrillo) who are now attending Chico (Kochlacs) and UC Davis (Thigpen)respectively. Both runners share their experiences during their first collegiate seasons in their first posts. It's definitely worth the read for any runners that have the desire to compete beyond the high school level. You can access their blog at the link below. 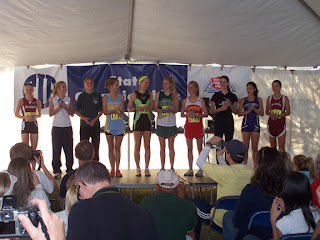 Both runners will also be contributing to this blog as well during the winter and Track and Field seasons. They will be a great addition! 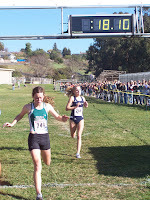 Left: Kochlacs finishing up at '06 Stanford Invite. 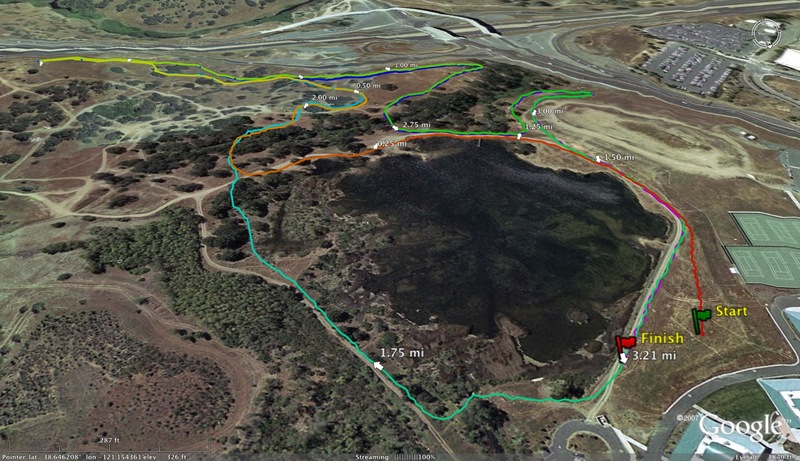 The following two links are the updates of every California team that has every made the podium at the cross country state meet. 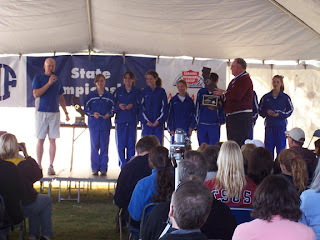 During the first year (1987), only 2 teams made the podium but to keep it uniform, I counted the top 3 teams in every state meet (1987-2007). The following links are courtesy of Hank Lawson's website. Top state meet individual times by section. The following are pictures of all the individuals and teams from Northern California that qualified for the podium (Top 10 for Individuals and Top 3 for Teams). Result links are also added. 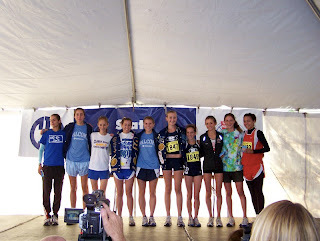 Top 10 Girls' Norcal Teams (by team times)Podium teams in RED! 13) Mt. 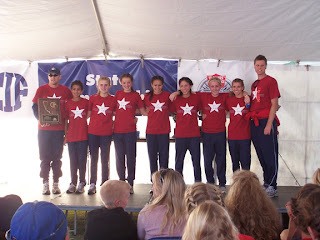 Shasta ( 19:40 1:38:18) State Champions! 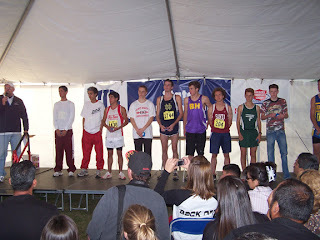 Top NorCal boy performers at 2007 State Meet. Overall placing in entire state is posted on the left hand side. 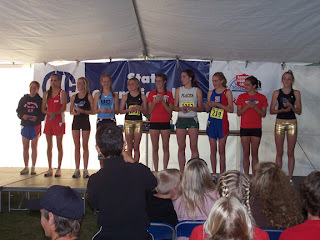 Top NorCal girl performers at 2007 State Meet. 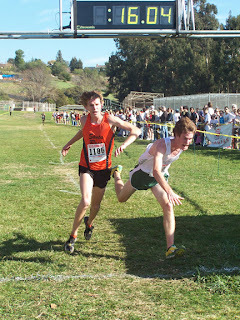 Feel free to comment on the CA state cross country meet before, during or after right here. I will be in transit the next couple of days so I won't be able to post until Saturday evening. Following the meet, I will post the top individuals and teams from Northern California as well as pictures of any state podium teams and any individuals in the top 10. Best of luck to all individuals and teams competing at this great event. This interview with Philip MacQuitty of Palo Alto was done the week following his victory in the hotly contested Div. 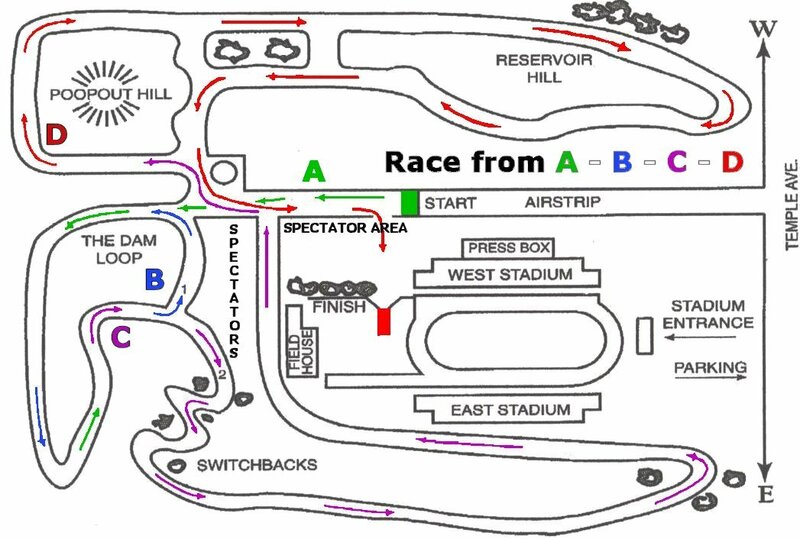 II race at CCS on Saturday, November 10th. 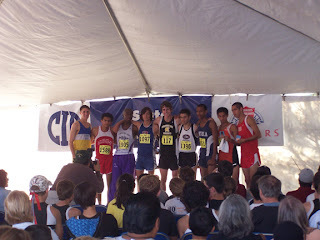 Philip has quickly established himself as one of the rising young stars in CCS and in the state of California. His big statement last year came in winning the CCS 3200 with a great finish to record an eye opening 9:11.99 as a FRESHMAN! You can watch a video of that race at this LINK (highly recommended to watch the thrilling last lap). The following list is from Jack Shepard and it has the fastest 3200/2 mile runners of all time as freshmen-All-Time Frosh 2 mile/3200 - 2007. During cross country, Philip has been involved in two of the most exciting races I have seen this year with his narrow victory over Garret Rowe (Mt. 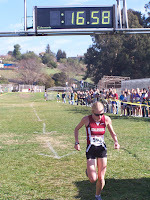 View) in the SCVAL final (pictured to the left courtesy of Palo Alto parent Clint Cummins, as both runners approached the final turn to the finish line) and the already mentioned CCS Division II final. 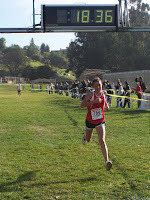 I seriously started running in 7th grade when i ran 4:50 for the mile. I started doing JOs and other meets just for fun. When high school came around, I started to get more serious about it. 2) When did you first realize you have a talent in distance running? 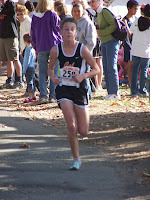 In 7th grade when I ran 4:50 on little to no training. 3) Describe your how your summer training went this year and what you did differently than before your 9th grade season. Well my training has been significantly harder and I do a lot more mileage. 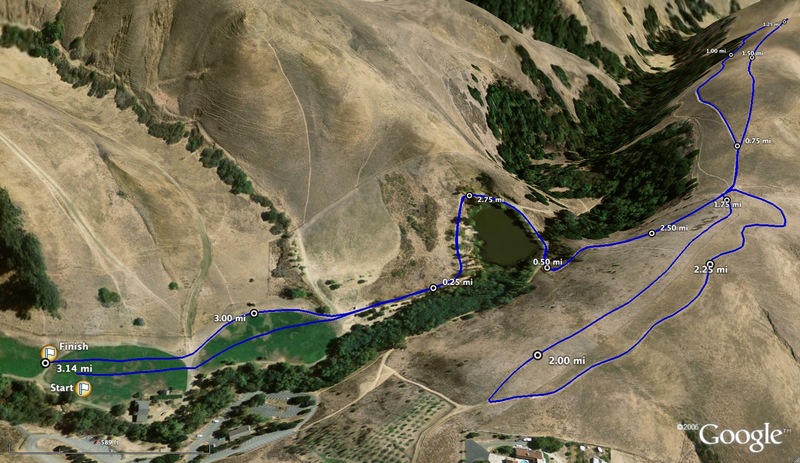 Last summer I was doing 20-25, this summer I did 35-40 with the long runs being anywhere from 7-10 miles. 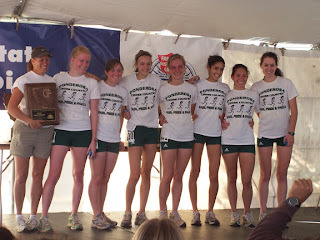 4) Tell us a little about how the Paly Cross Country team. Why has the team had such a successful season? Well truthfully, it is all due to my coach Jeff Billing and 4 great captains. We might not do the most mileage of workouts but nothing is wasted. Everything we do is for a purpose. We are trained to peak at points most beneficial to the person. 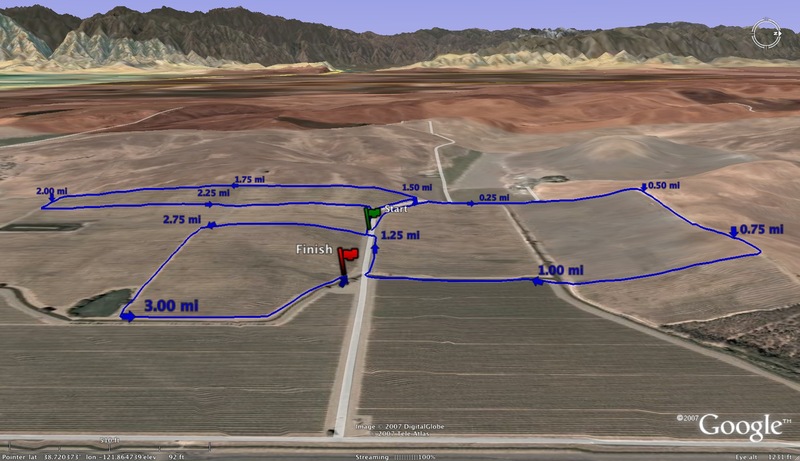 5) How has Coach Billing helped you become the runner you are today? Well, my coach has done almost everything in his power to get me where I want to be at the right time. I'd say setting hard goals at the beginning of the season is a good method of really pushing yourself. 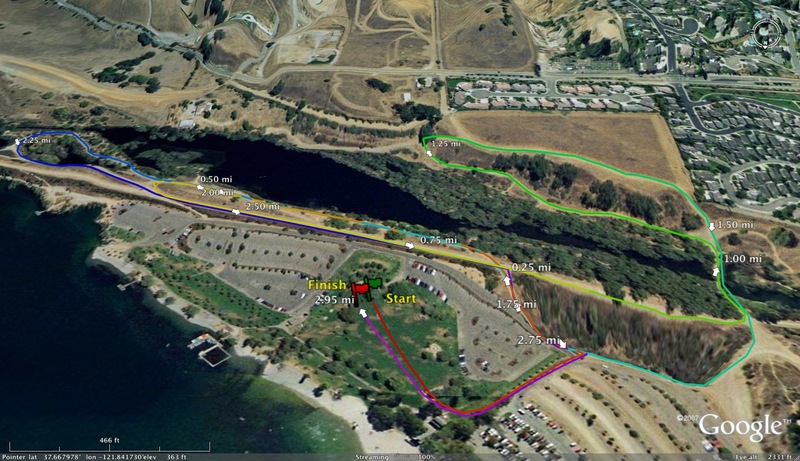 Like I've been pushing myself on these past workouts so I can try to get sub 15:20 at Woodward. He really cooperates with me to adjust some of the workouts to things I want to work on. 6) What workout(s) have you done that gives you a lot of confidence when you race? 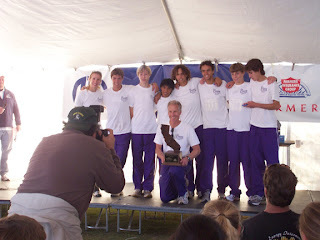 7) You went to the Billy Mills talk before the Mariner Invitational. What did you take away from his presentation? That dreams our achievable. That if you really focus and see yourself winning, you'll have a much better chance of doing it in reality. That nothing is imposssible. 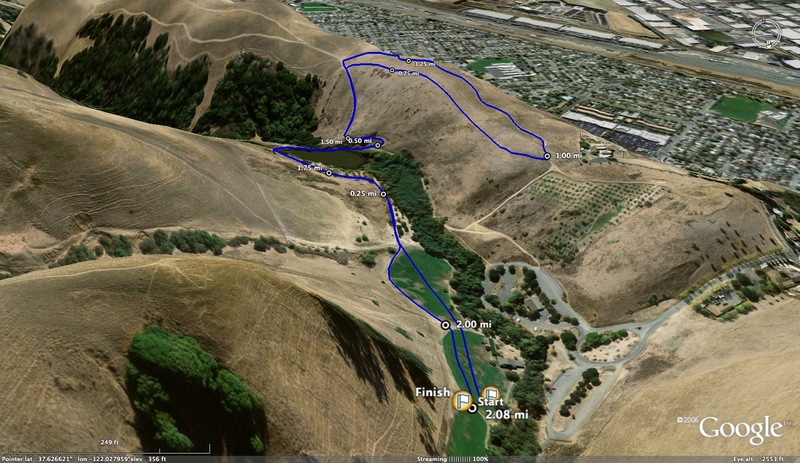 Something I took away that Billy said "I went through the 3 miles one second slower than my personal best... I said to myself just take lead and drop out the next lap, and i thinking that until the final lap". 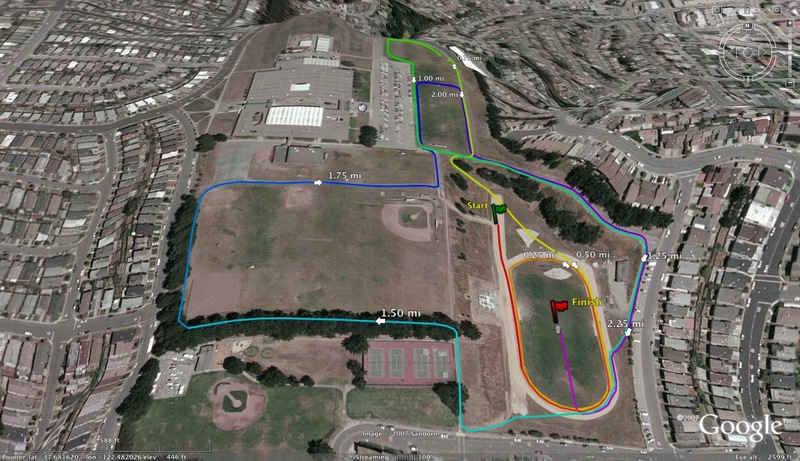 8) You have been part of three amazing races (CCS Final 3200 meters, XC League Final this year and CCS XC Final). Can you tell us a little about each race and if one of those stands above the rest. Well each of those race have beneficial to me by gaining confidence in myself and learning different types of racing. If I had to rank order them, I would put the 3200 finals way out ahead, then CCS XCs and finally league. They each taught me different things. The CCS 3200 taught me that everyone has a chance to win any certain race. The league meet taught me not to underestimate people such as Garret Rowe. 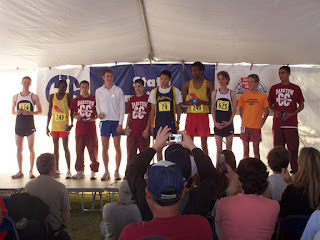 The CCS XC meet taught me how to adjust to different races (going out slow). 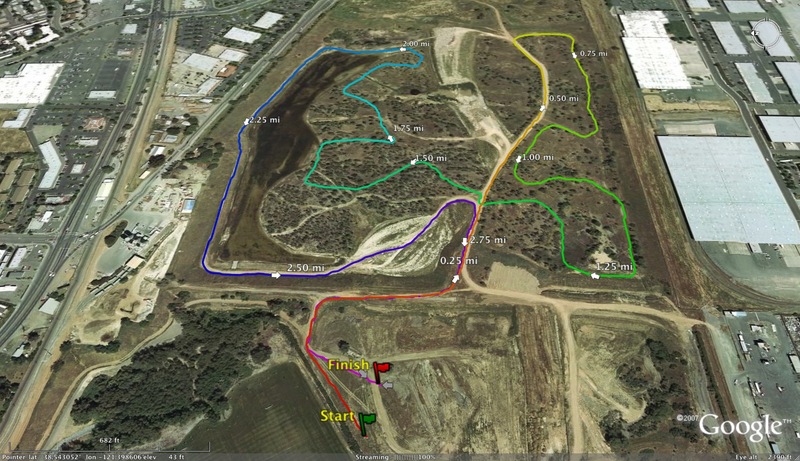 9) What is your favorite course in XC? 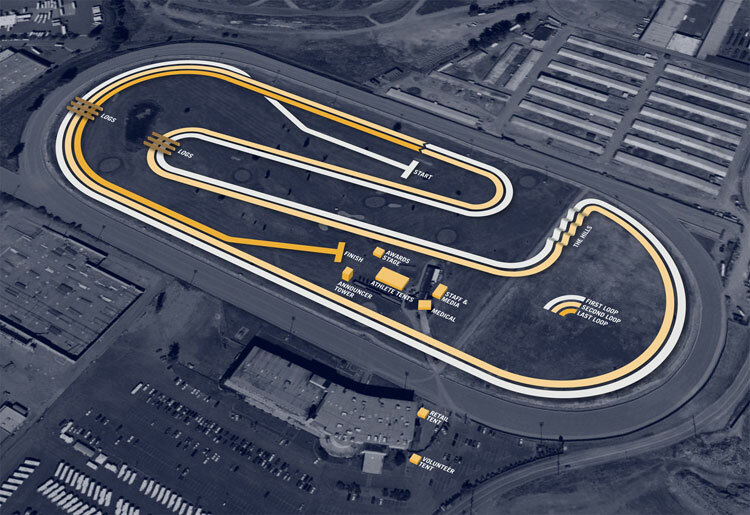 Favorite distance on the track? 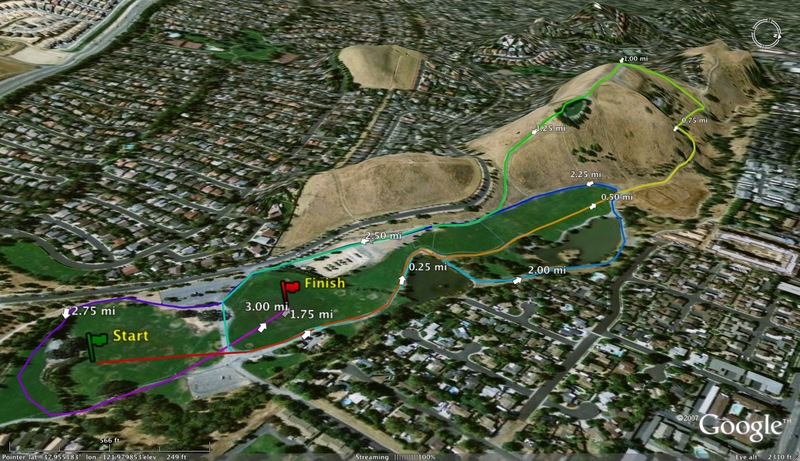 Mt Sac. 3200 and 800. 10) Any runners you look up to? Favorite competitor? 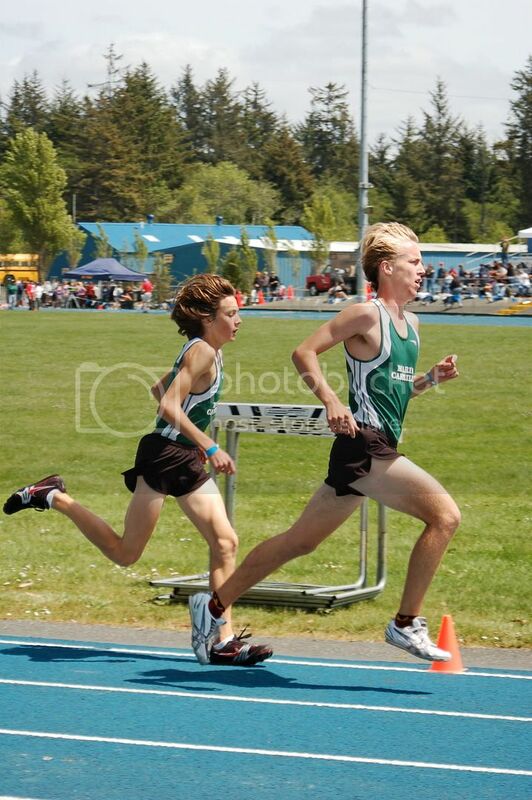 I look up to Pre and I really like (Galen) Rupp. My favorite competitor is Abdalla, because you never know what he can do. 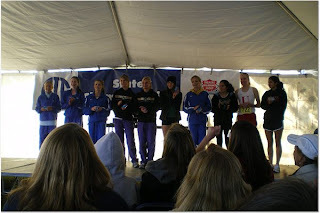 11) What are your goals for the state meet? Sub 15:20 and I'm trying to win d2 but I think that one is a little unrealistic. I like to say what a great race Charlie had with a huge pr by 21 seconds I believe. Thank you! Please add any newspaper articles' links I may have missed to the comments below. Final Norcal Rankings before State Meet are listed below. Matt Duffy was involved in one of the most exciting races this past Saturday as he had a come from behind victory over Willits' Kenny Smith. 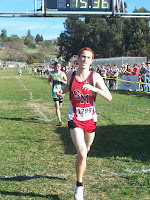 Here is his version of the race as well as his team's efforts at the NCS MOC. I once read that the journey is more important then the destination itself. On Saturday, I figured that out. 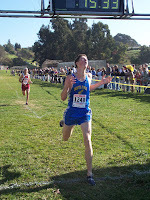 For both my team and me individually the goal was to win a NCS championship, disregarding time or margin of victory. In the end both goals were accomplished, though both much different then the other. Team wise I felt like we had an awesome performance, putting our #5 runner in before any other team's #2 runner while scoring only 40 pts. After our League Championship meet we made a goal to score under 55 pts., so needless to say we were very pleased. 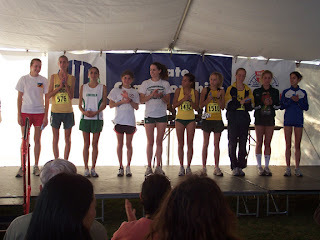 Individually things may not have gone as smooth as I had wished, in the second mile when I became fatigued it felt like the wheels were falling off, every runner and coach knows that feeling, and has seen or experienced it in some way. It is easy to expect things to go one way, but the truth is, which I am sure all of us can testify to is that most of the time things do not go as planned and you don't feel as you thought you would. For better or worse, that is how it is. So Saturday was a special day for me as I feel like I had the same struggle my sister did her senior year at the NCS Meet of Champions when she came from behind on the last downhill to win her third NCS individual title, it seems like some things run in the family and some things just happen. I know Saturday taught me an important lesson and that is to never quit, until you reach the line because nothing matters until the line is crossed. 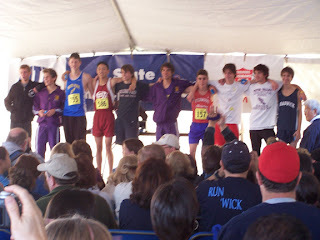 I would like to congratulate and wish Kenny Smith from Willits HS the best of luck and State and beyond, as he ran a tremendous race, was an amazing competitor and showed great sportsmanship. I would also like to congratulate our Girls team who won their first section title since 1999, scoring 39 points. It was an exciting day for our entire program and it is not something that we take lightly. Section championships are a special thing and it is not only important to remember the accomplishment but the journey that it took to get there. 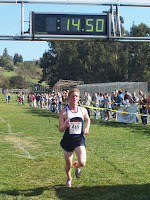 Saint Mary's congratulates everyone who ran, watched and cheered on Saturday for a job well done. Also I know we wish everyone the best of luck at the state meet as the journey continues another week. GO NCS! Thank you and happy thanksgiving! 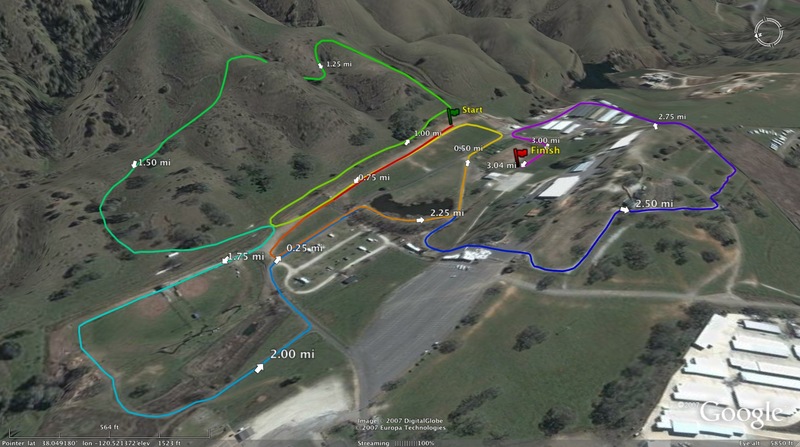 4 out of 10 races decided by sprint finishes! 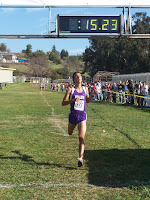 NCS Meet of Champions, AWESOME day of racing!